A portrait of Turkey’s former Prime Minister Ahmet Davutoğlu, who resigned in 2016 after falling out with Turkish President Recep Tayyip Erdoğan, was found in the garbage of Turkish parliament on Saturday as the country’s 27th term of expanded parliament took oath, secular Cumhuriyet daily reported. 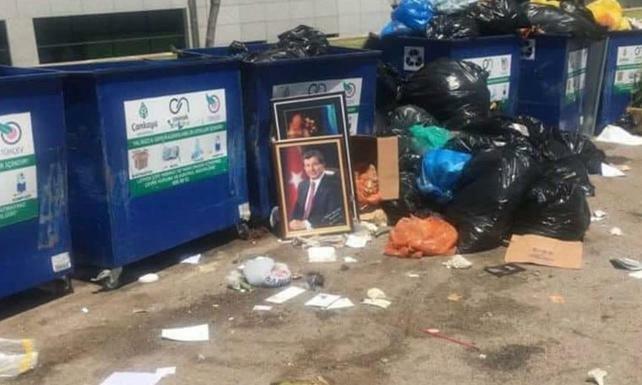 Twitter users on Saturday posted pictures of what they claimed was Turkish parliament’s garbage, featuring a framed portrait of the former prime minister. Davutoğlu was forced to step down as prime minister after 20 months in office, on May 5, 2016, after falling out of Erdoğan's favour. The division in the AKP created a pro-Davutoğlu group within the party which comprised a sizeable number of party members disillusioned with Erdoğan’s one-man rule. TBMM'de milletvekillerinin yemin töreni yapıldığı esnada eski Başbakan Ahmet Davutoğlu'nun portresinin Meclis çöplüğüne atıldığı iddia edildi.